Would you like a long weekend away but can’t take your dog? Are you reluctant to ask your friends or family to take care of your dog? Does the thought of putting your dog in a kennel make you a little nervous? Dogs get bored and lonely when left at home on their own, even for short periods of time. Dogs are by nature pack animals and would never be on their own in the wild. To avoid longing, isolation, and behavioral issues like chewed shoes or destroyed sofas, use our dog sitting service. 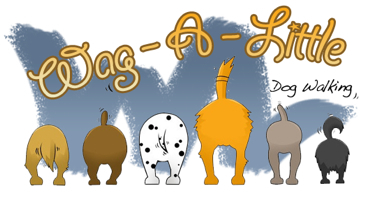 We'll visit your dog during the day, and for longer periods, one of our dog sitters will move in when you go away, or you can leave your dog with Wag-A-Little. Wag-A-Little's sitter will visit your home once, twice or more often each day, giving you security and peace of mind in your absence. The completely personalised pet sitting services we offer is also ideal for those pets with special needs, including blindness, deafness or lack of mobility. Dogs or cats too old or timid for a boarding arrangement are also welcomed. Our sitter can administer medication, follow your animal's special diets or food regime, and will have the understanding, compassion and experience to deal with nervous or timid animals that require a lot of patience and attention. The cost of our pet sitting service is very competitive when compared to kennels. Most importantly, our sitter will give your dog all the affection they need while you're gone, giving you total peace of mind and providing a trustworthy and reliable pet sitting service. It can be really distressing for dogs when their human pack leader or family have to travel on business, go away for long weekends or take a vacation. Your best friend is happiest at home with their own bed, toys and territory. When you book a sleepover, your dog will enjoy one-to-one affection during the day and the security of company overnight. Your business trip or vacation will be much more enjoyable knowing that your dog and home are in capable, caring and experienced hands for 24 hours a day during your absence. Switch lights on or off, giving you peace of mind and providing extra security for your dog and property. Clean food and water bowls. For just $25, plus grocery costs, we can make sure that there are provisions like bread and milk awaiting your return; it's all part of the Wag-A-Little service! Sitter's travel costs plus a food allowance of $10 per day. Ready to go? Please Book dog walking or pet sitting service or arrange your welcome consultation. Please note that in our opinion no dog should be home alone for longer than 6 hours at a time.